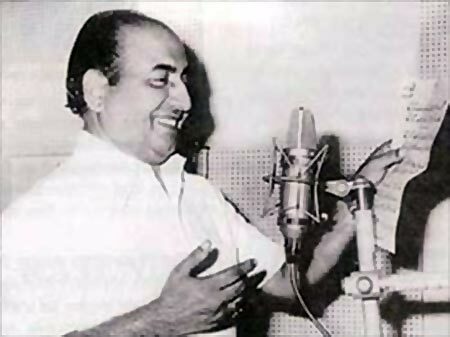 Mohammed Rafi passed away at the age of 55 in 1980. Yet, thanks to his extraordinary repertoire of soulful Hindi film songs from his equally illustrious career, his memory is as alive as ever in his devoted fans' minds. To mark the late legend's 90th birth anniversary today, December 24, we reproduce an earlier Rediff.com interview with Rafisaab's youngest son Shahid Rafi, who is writing a book on his father with author Sujata Dev. When my father was alive, we never thought of him as a big and popular singer. We knew he was famous, but for us he was just a father, we never felt he was a celebrity. 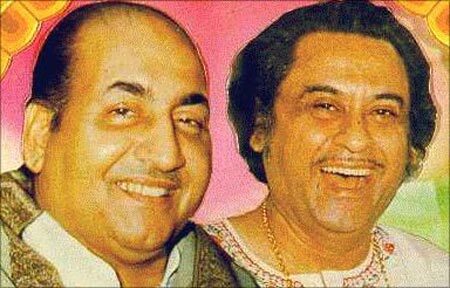 Once in a while our teachers gave us preference because we were Mohammed Rafi's children, but that was also rare. When my father travelled in his car and the car stopped at a signal, people would flock around his car, peeping inside to get a glimpse of him. My father was a man of few words. Once in a while he told us stories of his childhood days but mostly our mother would tell us about our dad. My father is from a small village called Kotla Sultan Singh, half an hour's drive from Amritsar city. From Punjab my father's family shifted to Lahore. This was before Partition. There my father was inspired by a fakhir -- fakhirs are not beggars, they are the people who sing and travel and spread god's words. My father trained under Ustad Abdul Wahid Khan and Ustad Bade Ghulam Ali Khan. My grandfather was totally against my father taking up singing so my father would not tell anyone at home that he was learning classical singing. My father was 19 when he came to Mumbai. He was married twice. He was married when he was very young in Lahore, to someone in the family. When he came to Mumbai and settled down, he wanted his wife to come to Mumbai but she refused. After that, my father married my mother Bilquis. My father's first wife had one son, Saeed Rafi. He came to Mumbai and stayed with us when we were growing up. We did not know he was our stepbrother because dad and mom never told us. He was an older brother for us. We are seven of us -- four brothers including me, and three sisters. In 1941, my father sang in a Punjabi film Gul Baloch, in Lahore. The film released in 1944. Shyam Sundar composed the music. Shyam Sunder asked my dad's elder brother to get my father to come to Mumbai as he had an excellent voice. My father came to Mumbai in 1943. He stayed in Bhendi Bazaar in south Mumbai with a close family friend, Abdul Hameed, who brought him to Mumbai. Hameed uncle would take my father to studios to meet producers and music composers. He got no work for four months and so started singing in the chorus. His second film was Gaon Ki Gori (1944) also with Shyam Sunder. His first big break was in Jugnu (1947), where he sang a duet, Yahan Badla Wafa Ka with Noor Jahan, composed by Feroz Nizami. He also acted as a college boy in the film. After Jugnu, he began getting noticed. Hameed uncle met Naushadsaab's father through a friend and asked him to give a recommendation letter in favour of my father. When they met Naushadsaab and handed over the letter, Naushad said, 'Tum ne toh aisi sifarish layi ke main na hi nahi keh sakta hoon' (I can't say no to the recommendation that you have brought). That's how my father got a break with Naushadsaab. But he was still singing in the chorus for a long time before Naushadsaab gave him his big break. My father was never nervous; he was a very big-hearted person. People say that my father was scared of Kishore Kumar. That is untrue. In fact, there are so many songs that my father told the composers to let some other singer sing because they too are good. In 1970, my dad went for Haj. Somebody had told him "Gaana bajana haraam hai, god will never forgive you." My father was a god-fearing person. He got scared and decided that he will never sing. He stopped taking new assignments. He went to London to be with his sons and daughter. He returned after eight months and after much coaxing from family and friends. 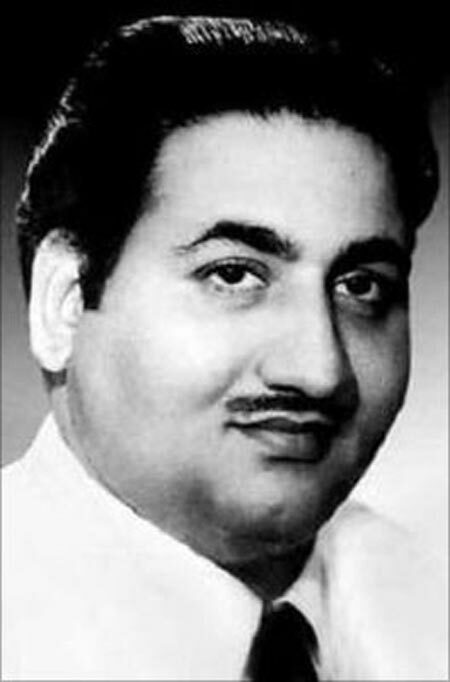 Initially, he got very little work as people had started liking Kishoreda's voice. Most of the songs went to Kishoreda, who had also become the voice of Rajesh Khanna. But soon, he started getting work again. He did lots of good movies and gave some hit numbers in films such as Naseeb and Amar Akbar Anthony. I was 19 when my dad passed away. It was shocking. I was with him. I can never forget that day. My mom had fever that day so she was sleeping and my dad was rehearsing for a Bengali song in the morning at home. He got chest pains but he finished his rehearsal and then came upstairs. My mom asked him what happened and he said 'I think I have acidity' and took medicine for that and went downstairs. His fingers were all blue. We were calling for an ambulance to take him to hospital but my father insisted on going in his own car to National Hospital in Mahim (in suburban Mumbai). He was immediately taken to the ICU and they wanted to fit him with a pacemaker but did not have one. So he was shifted to Bombay Hospital on the advice of his doctor, Dr Modi. On the way, he had three more attacks. At the hospital, he was taken straight to the operation theatre and a pacemaker was installed. Afterwards, my mother told him, "If you rest and get well, we can go home." My father told her, "Agar tum bolti ho toh my aaram karta hoon." (If you say so then I will rest). He slept but within five minutes, he was dead. There were a huge number of people at his funeral. Everybody came to see him for the last time. It was raining heavily, people lost their slippers and valuables in the crowd but yet they waited for the procession, they threw flowers from the buildings... My mother was completely broken. She couldn't believe he was gone. If my father was at home, he would go to bed at 9 pm and get up at 4:30 am and start his riyaz. Then he would go to the Bandra Gymkhana and play badminton with Naushadsaab, Yusufsaab (Dilip Kumar), and Anand Bakshi. Sometimes he would come home late at night totally stressed out because of too many recordings that day. My dad was a very calm person. He never scolded us; all the scolding and beating was done by my mother. But he was a disciplined person. My mother was strict but she kept the family together. He never went for parties; he loved spending time with his family. The only events he attended were weddings and award functions. My elder sister, who lives in London, got married two days before he recorded the song Babul Ki Duaein Leti Jaa. On the day of her bidai, my father did not cry. But when he recorded the song, he cried a lot. When among kids my father would be like a kid. He loved playing carom and badminton and to fly kites. Eid would be a grand affair at our house. My mother would make shirkhurma (vermicelli pudding) in a huge vessel and send it to actors, producers, directors and music directors. During Bakri Eid, we would send ghosht (meat) to everybody's house. We would cut about eight to 10 goats. After he expired, all this stopped. I am writing a book on my father titled Mohammed Rafi: Voice of Nation. It is co-authored by Sujata Dev. I was the authentic source where his personal life is concerned. But when we wrote about his career and music composers and his colleagues, we met those people ourselves. We did 60 interviews. I did a few personally, like with Shammi Kapoor, a month before he died, Rishi Kapoor, Randhir Kapoor. Shammi Kapoor was very fond of my father. They knew each other so well that whenever dad sang for him he knew exactly how Shammiji would act in that song and prepared accordingly. There was just one controversy that my father was involved in. 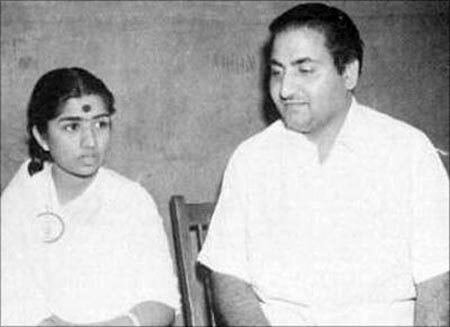 That was with Lata Mangeshkar, when she said she wanted royalty on the songs that they sang and my father said once the singer was paid, there was no need for royalty. They had a tiff and they did not sing with each other for quite some time. In fact, because of their differences, Suman Kalyanpuri's career got a boost as she started singing with my dad. Kalyanji and Anandji ended this fight. When I spoke to Anandji for the book, he told me that Kalyanji went to Rafisaab and Lataji and spoke to him and brought them together. Once Rafisaab sang a song for Jeetendra, who sent him the money at home. But the money was more than agreed on, so my dad called him and told him he had paid extra money. "I have increased the price," Jeetendra answered. The film had flopped but yet he paid more, but my father returned the extra money. Many rehearsals were held in our house but my father never allowed us to be part of it. In fact, he never forced us to become singers. We never went to any music recordings with him. He believed that if we are to become singers we must be as good as him, or better. But we couldn't touch his singing scale so none of us joined this industry. After dad passed away, I did learn music for a while. I remember just one recording. I had just come down from London and at that time I would go to Phalaj Nihalani's office to learn distribution. One day he had some work at the film centre in Tardeo. My dad was recording at the same place and Phalaj Nilani and I went and met him. It was R D Burman's recording. He was the composer and the film was Zamane Ko Dikhana Hai. My father was recording the song Poocho Na Yaar Kya Hua. I am opening a music academy in my father's name and I am also working on a museum. My father got immense love from the industry, and had lots of work when he passed away. There cannot be another Rafi. No one has replaced him yet and no one can replace him ever. Companies facing huge debts run by billionaires! #KashmirPhotos that'll take your breath away!